The mDiSP is a small, truly portable, battery (optional) and notebook operated, acoustic emission system. 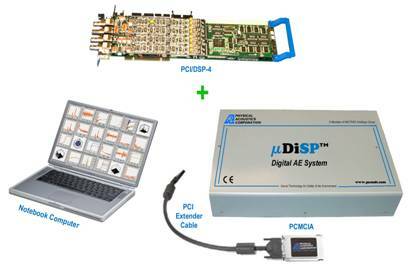 It is similar in size to a notebook computer, containing one or two PCI/DSP-4 cards to form a powerful 4 or 8 channel, simultaneous processing of Acoustic Emission features and waveforms, DiSP based system. Key advantages of the mDiSP over conventional AE system chassiss include its small size yet high channel density (up to 8 channels), its portability and light weight (less than 10 lbs), its connectivity to a notebook computer, all while maintaining very good AE acquisition performance and field ruggedness. An external connector allows connection of up to 8 parametrics, control input and Alarm output functions. Notebook computers have become a common and necessary tool for all professionals. That is why PAC is now capitalizing on this and making it a part of your AE system. The notebook computer, used in the AE examination as a mDiSP Controller, contains the collected AE data. After the AE test, the same notebook can be used to do the analysis of the data, or for preparing the report, whether on-site, in a hotel or on an airplane. There are 2 models ofmDiSP, one AC powered only and one for AC/DC powering with or without internal battery option for up to 85 minutes of operation on a charge. The mDiSP chassis is 16'' long 9.5'' wide and 2.9'' high and is comfortable sitting just below the notebook computer. The mDiSP comes complete with a PC-Card and cable to plug into the notebook computer's PCMCIA connector port. Most Notebook computers are compatible with the mDiSP PC-Card interface. The system requires a notebook with Windows 98 (Second Edition), ME, 2000 or XP to operate and will run with PAC's AEwinTM WINDOWS software. While the majority of "name brand" notebooks are compatible with the mDiSP's PCMCIA Card, Envirocoustics will provide our customers with "best effort" service to interface your computer to our system. Envirocoustics advises that the customer purchase the notebook from Envirocoustics or call in advance to determine if their existing notebook is compatible for the mDiSP.